HARARE (Reuters) - As social media exploded with outrage this week at the killing of Cecil the lion, the untimely passing of the celebrated predator at the hands of an American dentist went largely unnoticed in the animal's native Zimbabwe. The government has still given no formal response, and on Thursday the papers that chose to run the latest twist in the Cecil saga tucked it away on inside pages. One title had to rely on foreign news agency copy because it failed to send a reporter to the court appearance of two locals involved. In contrast, the previous evening 200 people stood in protest outside the suburban Minneapolis dental practice of 55-year-old Walter Palmer, calling for him to be extradited to Zimbabwe to face charges of taking part in an illegal hunt. Local police are also investigating death threats against Palmer, whose location is not known. Because many of the threats were online, police are having difficulty determining their origins and credibility. Palmer, a lifelong big game hunter, has admitted killing Cecil with a bow and arrow on July 1 near Zimbabwe's Hwange national park, but said he had hired professional local guides with the required hunting permits and believed the hunt was legal. For most people in the southern African nation, where unemployment tops 80 percent and the economy continues to feel the after-effects of billion percent hyperinflation a decade ago, the uproar had all the hallmarks of a 'First World Problem'. "Are you saying that all this noise is about a dead lion? Lions are killed all the time in this country," said Tryphina Kaseke, a used-clothes hawker on the streets of Harare. "What is so special about this one?" As with many countries in Africa, in Zimbabwe big wild animals such as lions, elephants or hippos are seen either as a potential meal, or a threat to people and property that needs to be controlled or killed. 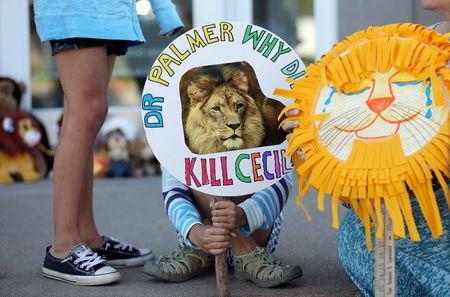 The world of Palmer, who paid $50,000 to kill 13-year-old Cecil, is a very different one from that inhabited by millions of rural Africans who are more than occasionally victims of wild animal attacks. According to CrocBITE, a database, from January 2008 to October 2013, there were more than 460 recorded attacks by Nile crocodiles, most of them fatal. That tally is almost certainly a massive underrepresentation.